Matthew Booth never thought his first trip out with a metal detector would find anything of real value. Maybe some coins or old bottle caps, if he’s lucky. Little did he know that when his machine started beeping in a field outside of Stirlingshire, Scotland, that he’d uncovered a rare and valuable treasure trove. 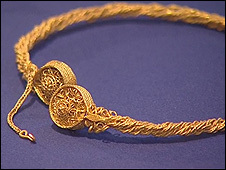 Booth’s discovery was three Iron Age gold necklaces called torcs, each over 2,000 years old. Not too shabby for his first time out with his metal detector! Unfortunately for Booth, he doesn’t get to keep his treasure, which the Scottish Archaeological Finds Allocation Panel could value at £1,000,000 or more. All treasures uncovered in Scotland go directly to the Crown. However, odds are good that he’ll get some kind of monetary compensation for his discovery, even if he’s not guaranteed the full amount of value like he would had he uncovered his find in England.